AGNITAS E-Marketing Manager (EMM) is an award-winning and powerful e-mail marketing software suite. We have added new communication channels, expanding EMM into a digital push marketing system, but the main focus remains on e-mail – and for a good reason. E-mail marketing is still the most important digital push medium! We here at AGNITAS recognized this more than 18 years ago. That’s why our founder, Martin Aschoff, made every effort to be the first provider on the German market to develop e-mail marketing software. That marked the beginning of the AGNITAS E-Marketing Manager. Demand for this medium continues to be high. Despite numerous new communication channels and touchpoints, e-mail is indispensable to our daily communications routine. 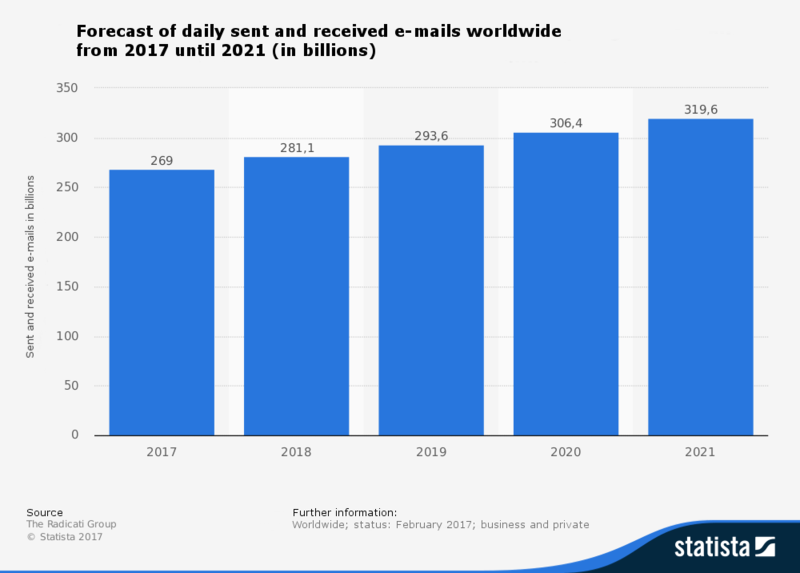 Recent statistics even predicts additional growth for e-mail. E-mail marketing has compared to other communication channels many benefits. The most important benefits you will find beneath, but of course there are much more. With our e-mail marketing tool EMM you will profit from all of these benefits. Mailings cost only a fraction compared to other media. In addition, e-mail is the most effective channel to generate high turnover. E-mail marketing lets you achieve true 1:1 marketing. Keep track of individual orders or make individual product recommendations. First reactions are measured almost as quickly as the e-mails arrive. You can assign each reaction to a specific recipient. In the recipient’s inbox, you get their full attention – as opposed to banners, external advertising, etc. Customization can increase this even more. You can see clearly who actually received and opened the e-mail. Who clicked, when and on what links as well as which products were bought. Any form of response tells you more about your leads. Use this knowledge and enrich your receiver profiles with behavioral data. The recipient receives the message very quickly. You can do short-term advertising and real-time marketing. You decide when a lead receives a message – from immediate e-mails to advertising campaigns planned in advance, anything is possible. Your mailing arrives directly in the recipient’s inbox. It does not need to pass through several hands before reaching its goal. E-mail marketing without automation is unthinkable today: from multi-level newsletter campaigns to individual e-mails, to real-time content in mailings, AGNITAS e-mail marketing software lets you master these tasks with ease. Find out more about marketing automation in the EMM here. Good e-mail marketing requires that you know your recipients and be flexible in your approach. 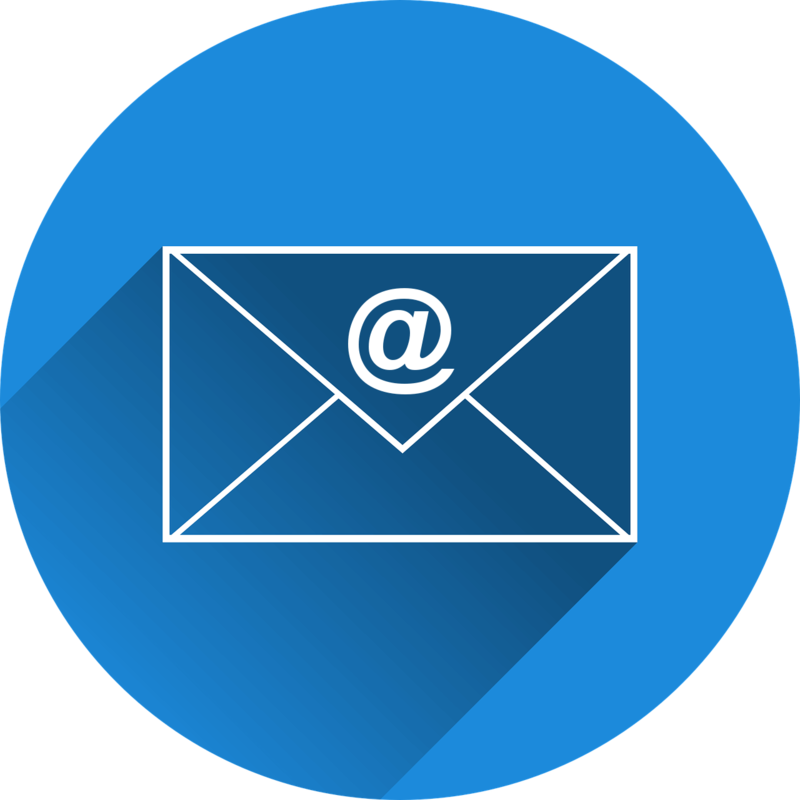 From the individual recipient to target groups, to complete distribution lists, our e-mail marketing tool covers all distribution sizes. The recipient response and behavior data are used for profile enrichment. Find out more about lead management in the EMM here. The success of your newsletter campaigns depends largely on your content. With our software, you can take full advantage of the static content that is the same for everyone, the dynamic content that is generated at the moment of opening, or the custom content (e.g. shopping behavior). In addition, we also offer a customized content in the form of personalized images, the daily horoscope, the local weather, and the name tag information. What’s more, we have an in-house editorial team for editorial content. Find out more about content marketing in the EMM here. A professional newsletter tool must integrate into existing IT infrastructure and constantly exchange data with other systems. AGNITAS E-Marketing Manager provides you with numerous interfaces to exchange data manually, semi-automatically or fully automatically. The data exchange is bidirectional and possible in real time. Find out more about interfaces in the EMM here. What’s the use of a great e-mail when it gets stuck in the spam filter? As a trusted newsletter tool provider, we are a member of the CSA and the DDV. By adhering to the code of honor and various other measures, we ensure the whitelisting of our mail server and thus the delivery of your mailings. Find out more about whitelisting in the EMM here. Bounce management plays an important role in EMM as it has a direct impact on the success of your e-mail marketing campaigns. That’s why we’ve implemented sophisticated bounce management. Find out more about bounce management in the EMM here. Data protection and data security are the nuts and bolts of reliable newsletter software. That is why, since our foundation in 1999, we have placed the highest value on the protection of your data. We ensure this through physical, electronic and legal means. 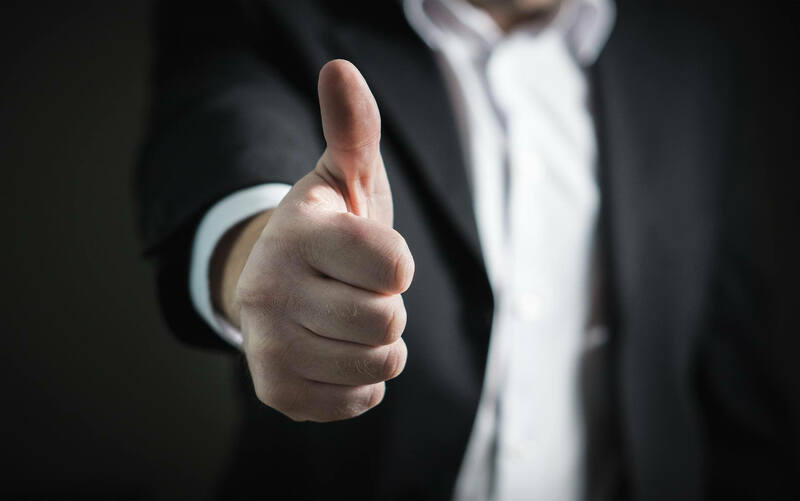 ISO certification according to standards 27001, 27017 and 27018 confirms the highest level of confidentiality, integrity, and availability of our software. Find out more about data protection and security in the EMM here. Want to get to know the software? Request a trial account. AGNITAS E-Marketing Manager already offers hundreds of features in its standard variant. You can find the most important features beneath. Newsletter creation is a breeze with the E-Mail Creator. Our e-mail marketing tool comes with an intuitive modular system with various responsive templates. Knowledge of HTML is optional and users with less technical experience can easily create attractive newsletters. You can simply place the modules using drag & drop and rearrange them at any time. Each module can be increased or decreased in size. And you can customize content as you wish. 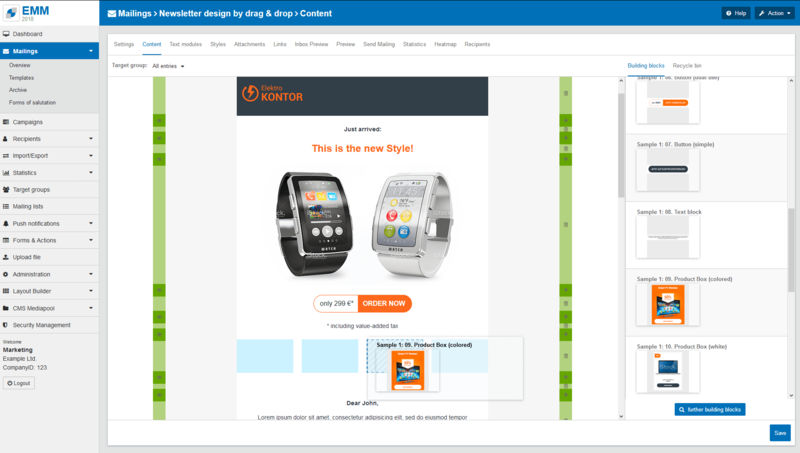 With the Layout Builder premium feature, you can create your own building blocks and templates for the E-mail Creator. If you do not have the necessary resources for this, we will gladly create an individual template for you. Tip: anyone who prefers to create newsletters with HTML has all the options to design individual mailings via HTML in our software. The Campaign Manager makes it easy to create multi-level and complex campaigns. Planning, running and evaluating campaigns are easy in our e-mail marketing software due to the graphical display and intuitive editor. Use drag & drop to design the campaign workflow. Each icon is linked to an area in the software and offers various options. 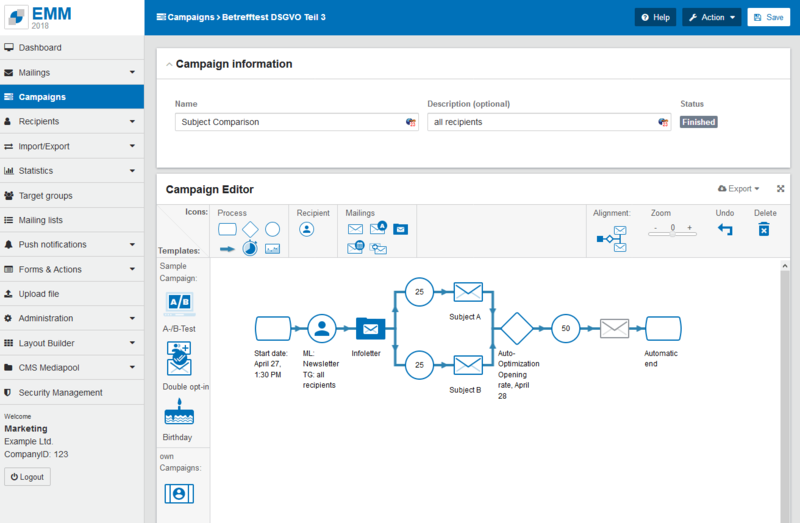 The premium feature Automation Package allows the Campaign Manager to maximize its functionality. Even no paths to decision icons can be integrated into the campaign. And more functions are possible. For all mailings and newsletters that are sent only once at a fixed point in time. For all mailings that are triggered by a recipient-specific date (e.g. birthday, anniversary, name day). For all mailings that are sent by a trigger (e.g. reaction, purchase, termination). For all mailings that are sent in a certain cycle (e.g. contribution fees, account balances, bonus points). For all mailings that follow up based on the reaction to former mailings (e.g. opening, click, purchase). A newsletter tool without recipients? Unthinkable! In EMM, you have multiple levels to manage your addresses. The smallest unit is the single recipient. You can define characteristics like age, gender, place of residence, interests, etc. in their profile. The recipient profile also provides information on activity, response data and legal information. There are an unlimited number of recipient profiles available. You can use these characteristics to create target groups that share characteristics or meet certain conditions. There are an unlimited number of target groups available. The biggest common denominator is the mailing list. With this you manage different distributors, e.g. B2B and B2C. Again, there are an unlimited number of mailing lists available. One of the great strengths of e-mail marketing is the transparency that comes from a great measurability. This is why our e-mail software offers you an endless amont of statistics, charts and metrics. 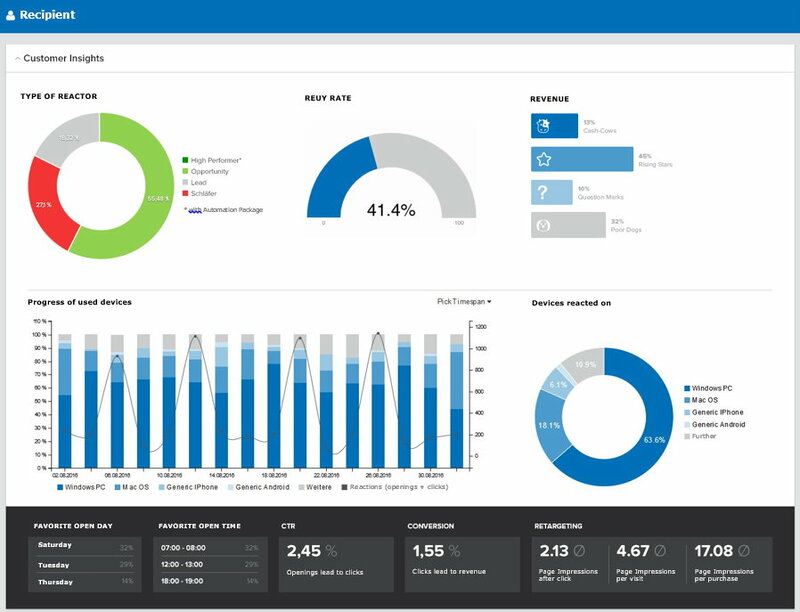 You get all the information you need about the success of your e-mails, from response metrics on the mailing over time to relative and absolute values, to heatmaps and mailing comparisons as a benchmark statistics for your industry. You can limit this to any granularity by adding target groups. In addition to the mailing, you will also find numerous key figures for the individual recipient and evaluations of your distributors, e.g. IP addresses, equipment types, subscriptions and cancellations. But EMM offers even more statistics which you can export and process in different formats. Behavior Tracking on your website allows you to send individual offers by e-mail. Send your mailings during the preferred opening times of the respective recipient. Not every bounced address remains permanently inaccessible – the AHV allows you to reactivate irregular bounces. Check the appearance of your mailings before sending them to different devices, browsers and e-mail clients. Automated data exchange without the time-consuming programming work. In addition to e-mail, you can also use WhatsApp, web push notifications, Facebook Messenger, SMS, and fax. Versions of our e-mail marketing software We have the right solution for every need! 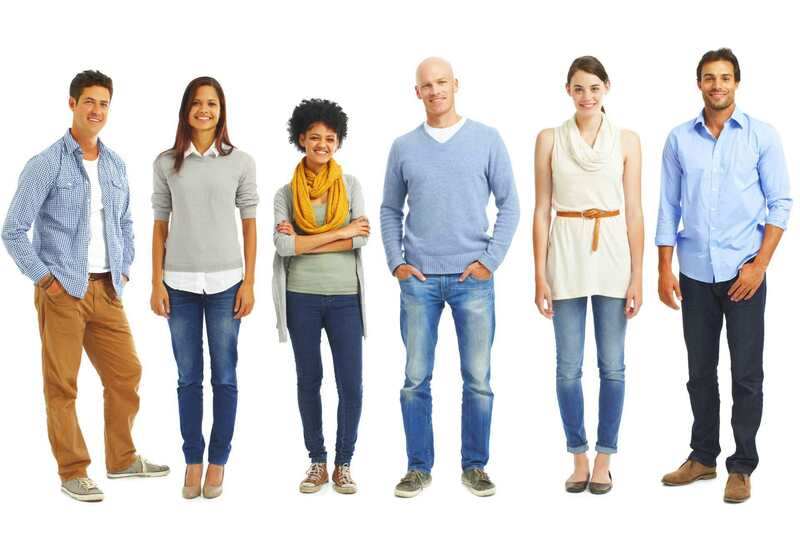 We know that every customer is unique and has different needs for their newsletter tool. Some want to outsource as much workload as possible to focus on sending newsletters. Others want to manage everything in-house as much as possible to maintain maximum control over the data and processes. For some, cost is the deciding factor, while others value the widest possible range of features. We have the perfect solution for all these needs. ✓ The software license version gives you maximum control over your data. An address transfer to third parties is not required. ✓ Buy the software license once, use it permanently. ✓ Regular updates and new features are available through the maintenance contract. ✓ No usage fees for sending mailings. ✓ In the open source version, you have access to a significantly limited range of E-Marketing Manager functions at no price. ✓ You take care of the installation, configuration, maintenance and administration of the software yourself. To find out more about the functional differences between the software versions, see our function overview.